London's Queen Elizabeth Olympic Park will be available to host corporate events from as early as next summer, with the Multi-Use Arena the first venue planned to reopen in July 2013. The Multi-Use Arena will be the third largest arena in the capital with capacity for up to 7,500 delegates for conferences or 2,000 for a gala dinner. The 560-acre Olympic Park will offer 15 outdoor event spaces in total, and five sporting venues including the Olympic Stadium, Aquatics Centre and Velopark. Available from Spring 2014, the Aquatics Centre will have capacity for 2,500 for seated events, or 500 for poolside dining or drinks, and moveable floors within the giant pool hall can be raised to create a dry space for events. 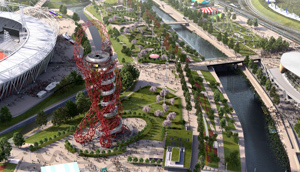 The Arcelormittal Orbit, the UK’s tallest sculpture – 22m higher than the Statue of Liberty – will also be available for corporate hire from Spring 2014. Two glass-enclosed platforms with capacity for 300 in total and views across the park and Greater London can be used for launch events or drinks receptions. Keith Bendall, senior marketing manager for the London Legacy Development Corporation, said that the opportunities for outdoor events are huge. "There are the wetlands for outdoor activities, or you could have a floating cinema, festivals and concerts, and pop-up marquees for dinners or conferences."